Clathrin is a triskelion-shaped cytoplasmic protein that polymerises into a polyhedral lattice on intracellular membranes to form protein-coated membrane vesicles. Lattice formation induces the sorting of membrane proteins during endocytosis and organelle biogenesis by interacting with membrane-associated adaptor molecules. Clathrin functions as a trimer, and these trimers, or triskelions, are comprised of three legs joined by a central vertex. Each leg consists of one heavy chain and one light chain. 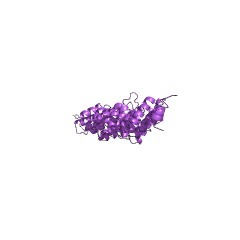 The clathrin heavy-chain contains a 145-residue repeat that is present in seven copies [(PUBMED:10360576), (PUBMED:17702618)]. The clathrin heavy-chain repeat (CHCR) is also found in nonclathrin proteins such as Pep3, Pep5, Vam6, Vps41, and Vps8 from Saccharomyces cerevisiae and their orthologs from other eukaryotes [(PUBMED:10360576), (PUBMED:11160821), (PUBMED:12906858), (PUBMED:11448994)]. 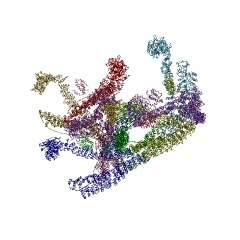 These proteins, like clathrins, are involved in vacuolar maintenance and protein sorting. 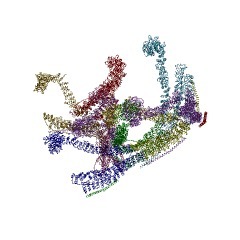 The CHCR repeats in these proteins could mediate protein-protein interactions, or possibly represent clathrin-binding domains, or perform clathrin-like functions. CHCR repeats in the clathrin heavy chain, Saccharomyces cerevisiae Vamp2 and human Vamp6 have been implicated in homooligomerization, suggesting that this may be the primary function of this repeat. 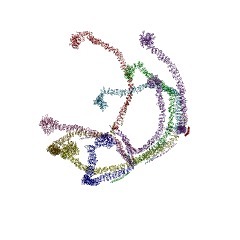 The CHCR repeat folds into an elongated right-handed superhelix coil of short alpha-helices [(PUBMED:10360576)]. Individual 'helix-turn-helix-loop' or helix hairpin units comprise the canonical repeat and stack along the superhelix axis to form a single extended domain. 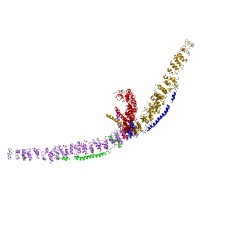 The canonical hairpin repeat of the clathrin superhelix resembles a tetratrico peptide repeat (TPR), but is shorter and lacks the characteristic spacing of the hydrophobic residues in TPRs. There are 15795 CLH domains in 3386 proteins in SMART's nrdb database. Taxonomic distribution of proteins containing CLH domain. This tree includes only several representative species. The complete taxonomic breakdown of all proteins with CLH domain is also avaliable. Click on the protein counts, or double click on taxonomic names to display all proteins containing CLH domain in the selected taxonomic class. This information is based on mapping of SMART genomic protein database to KEGG orthologous groups. Percentage points are related to the number of proteins with CLH domain which could be assigned to a KEGG orthologous group, and not all proteins containing CLH domain. Please note that proteins can be included in multiple pathways, ie. the numbers above will not always add up to 100%.